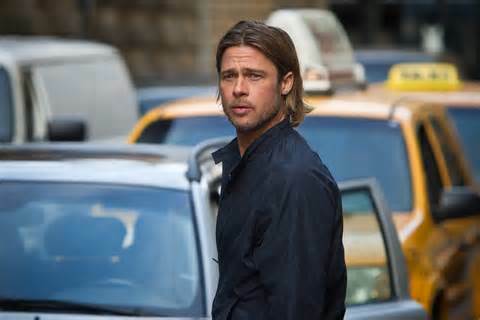 Fans of Max Brooks’s novel World War Z are less likely to be disappointed than baffled by Brad Pitt’s big screen adaptation. The film has about as much in common with Shakespeare as it has with Brooks’s wonderful, fictitious oral history of the zombie pandemic. Still, it’s not a bad flick. Not at all. Pitt plays Gerry Lane, ex-UN investigator pulled back into active duty to determine the cause of – and ideally find a cure for – the zombie outbreak that is decimating the world population and will otherwise spell our ultimate doom. Pitt, who produced as well, teams with director Marc Forster, a filmmaker better known for moody drama (Monster’s Ball, The Kite Runner) than zombie adventure, but he handles the task with aplomb. The film opens briskly, establishes empathetic, realistic characters (assuming you can forgive one wholly unrealistic and insultingly idiotic decision Forster’s team of writers drummed up for Gerry’s wife), then throws episode after episode of chaos at you until you’re breathless. Not a bad way to piece together a zombie movie. Of course, this is not exactly a zombie flick. It’s not a horror film at all. WWZ is an intelligently crafted international thriller and action movie that happens to include zombies. Between Pitt’s caring investigator and Forster’s ability to maintain heart pounding urgency for two full hours, they pull it off pretty well. Surprises abound (especially if you’ve read the book), and though there are images here and there that recall one Z-flick or another (28 Days Later, in particular), on the whole, the film creates its own niche. Though seeing the 3D version is not ultimately necessary, the added depth gives visceral impact to the many helicopter shots of chaos below, while providing quiet scenes a sense of “what’s around that corner?” dread. Indeed, tension and dread counterbalance thrill effectively in a flick that keeps you guessing, jumping, and rooting for an intelligent and caring hero. It’s certainly a more kind-hearted imagining of the apocalypse than the one Brooks offered, where nations turned on each other, the greedy and superficial partied on as though they were immune, and governments enacted gut-wrenching action to try to stem the outbreak. Pitt and Forster – and their team of writers – pull a lot of punches Brooks was happy to land. Their intent was clearly quite different, and the result worthwhile. I guess it’s just the title they liked. You Can’t Punish in Here. This is the Red Room of Pain!